Developed and patented by HAMM, this premium solution is the only one of its kind on the market. It can be seen in the DV+ 90i VS-OS at Bauma 2019. A separate, mechanically-independent oscillation unit operates in each half of the split oscillation drums. An integrated control mechanism adjusts the rotational speeds of each half of the drum to match one another. The synchronisation is done electro-hydraulically. Because the system reacts quickly and precisely, synchronous vibration in each of the two drum halves is guaranteed in any situation. This reduces the danger of cracks in or displacement of the asphalt, and is ultimately a great advantage in terms of quality. With the world's first VIO compaction meter, HAMM is expanding its range of modules for compaction measurement and documentation at Bauma 2019. HAMM is thus the only manufacturer offering the ability to measure compaction in oscillation mode. This means that HAMM rollers can document their passes in a traceable way, even for continuous dynamic compaction control applications with oscillation. The system is already available for the H 7i VIO and H 13i VIO compactors. Over the past few years, HAMM has launched the innovative operating concept Easy Drive onto the market. It is the result of an extended research and development project over a number of years in which HAMM has collaborated with universities and ergonomics specialists as well as roller drivers from different countries. Easy Drive offers machine operators ample clearance, optimum ergonomics and plenty of comfort, in addition to advantages such as intuitive and therefore safe user guidance, the shortest possible learning and familiarisation times and an operator's platform that can be adjusted to practically any body height. To date, HAMM has predominantly enjoyed synergies with the Wirtgen Group in the area of asphalt compaction. The integration into Deere & Company is giving the compaction specialists additional opportunities, particularly in the area of earthworks. HAMM is highlighting this with a separate exhibition area dedicated to earthworks at Bauma 2019. Here, the manufacturer will present a number of machines with solutions for all markets and a wide variety of applications from its broad spectrum of products for earthworks – including various configurations and options. These also include innovations such as the ‘C’ compactors for heavy earth work, and the newly developed dozer blades. 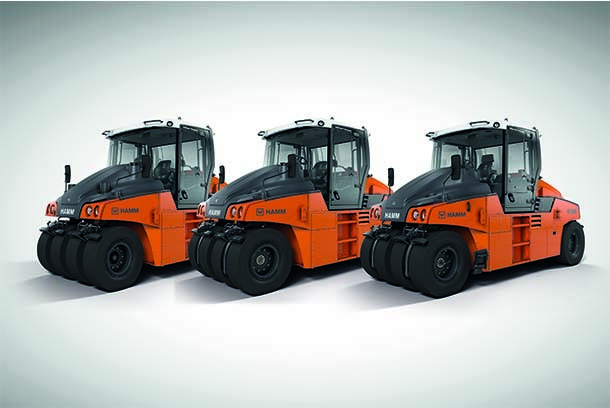 At Bauma 2019, the range of H series compactors is being expanded to include the “C models". These machines are fitted with a reinforced hydrostatic drive and provide up to 30% more torque, giving them much better traction and climbing ability than that of the standard models. They are perfectly equipped to deal with heavy earth work, landfill construction and the compaction of cohesive soils. Despite this, they are still economical: fuel consumption in the models with and without reinforced drives is almost identical because the same diesel engine is used in each of the rollers.